Greetings, Keepers of the Classic Castle! I have a question regarding posting pictures in the CC fora: is it OK to post pics that one has posted elsewhere? 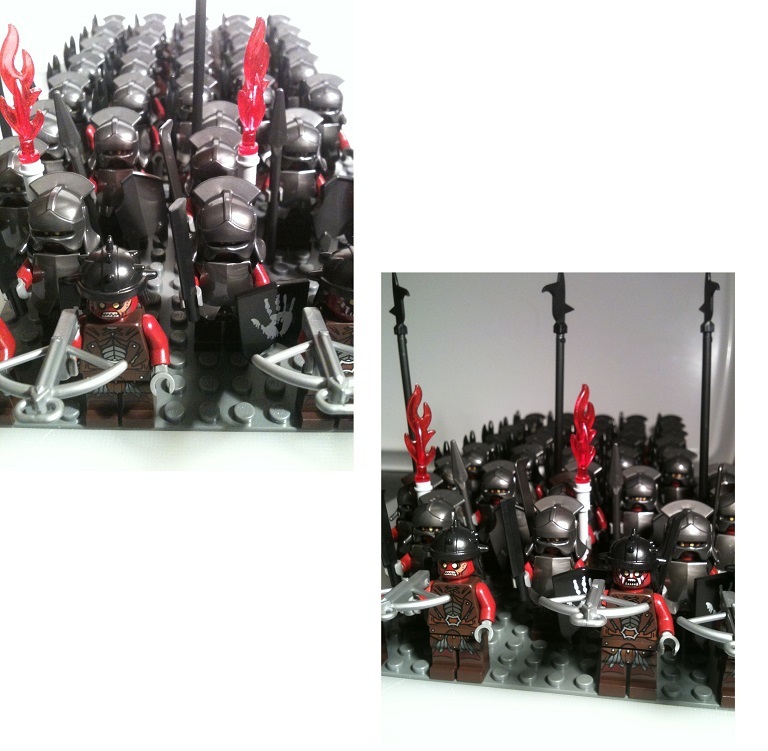 I posted pictures of a modification to the Dragon Mountain set as well as some MOC'ed Lord of the Rings minifigures over at Eurobricks. Is it OK with you if I also post them in the CC fora? Please let me know one way or t'other. I checked the FAQs but couldn't find an answer. Peter: "You've got Legos? Cool! Lois only gets me Mega Bloks." Lois: "It's the same thing." To answer your question, I need to ask you a question. Are these for the CCC? Or just a moc that you are going to show us too that isn't for the contest? If they are for the CCC? Well there is a rule about that. If they aren't, go right ahead. Thanks for your reply. None of my MOCs are or will be entered in any CCC contests. I'm an AFOL for the fun of it, not to win competitions. It's perfectly fine to post MOCs here regardless of where they've been posted before. Castle (broadly defined) themed creations should go in 'Castle MOCs'. Anything that involves painting/decals/sculpy/etc goes in 'Castle Customs'. Non-castle creations go in 'General LEGO'. If you did want to enter something in the CCC, it should be something that had never been displayed online or at an AFOL event before the start of the CCC (November 1). If a picture is just of minifigs with no heavy modding, i.e. no paint, cutting or sculpting, such as this one http://www.brickshelf.com/gallery/Amper ... _small.jpg where does it go? Eurobricks has its own forum for all minifigure-related posts regardless of theme, i.e. even if a picture is obviously theme-specific such as my Uruk-Hai army picture linked to above, you can't post it in the historic/fantasy forum. Is there a similar rule here? CC does not have a minifig-specific forum. Sometimes people have treated the Customs forum that way, but that is not correct. Properly, minifigs belong either in the MOCs forum (if they are Castle-related--including LotR, Prince of Persia, Ninja, and Vikings) or in the General forum (everything else). With this particular picture, you could post to Customs if you wanted to emphasise the custom headgear (I think that's custom...) that the front couple orks are wearing. Mostly, we haven't been a community that has been very excited about pictures of minifigs by themselves. If we're talking about new (or old!) set-official minifigs, they belong in the Castle forum or the General forum (depending on the theme), or if it's a really good picture we want to talk about, they could belong in the Publishing forum, and as a demonstration of clever-posing it's considered part of the MOCs forum (or general, if not Castle-related), or if it's part of a story it might belong in Stories... but pictures of minifigs that are just pictures of minifigs and none of the above things would belong in MOCs.